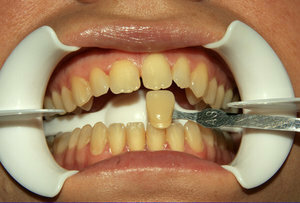 Concealing yellow teeth is part of a process going on for at least the past century. While teeth cleaning tried to arrive at a reasonable solution, this did not always work.Teeth whitening or bleaching was another attempt. When these processes failed to achieve the desired effect, people turned to other means of reaching the desired goal. This included tooth replacement and veneers. In the United States, two men laid much of the groundwork. First kudos extends to Samuel Stockton in 1825. He began to manufacture porcelain teeth in Philadelphia.Under his auspices, his nephew founded the first commercial venture - the S. S. White Company. It began to produce artificial teeth on a large scale, making them available to the average consumer. Although a far cry from porcelain veneers teeth, these early false teeth were a step-up from ivory and wooden falsies. In 1937, Charles L. Pincus took the search for white, clean teeth a step further. In a bid to help Hollywood actors appear to have a sparkling smile – at least in front of the camera and the adoring public, he came up with a removable device. Pincus created a detachable porcelain veneer. The dentist attached the material to the teeth of the individual. In a flash, all teeth stains disappeared. Unfortunately, the glue was not long lasting. Suitable adhesives did not appear until later. Yellowing teeth became the target of the average American in the mid 20th century. In the cult of celebrity, everyone wants white teeth. However, many people naturally have yellower teeth. No matter how frequently they brush, while clean teeth are possible, sparkling teeth are not. Food and drink choices - Certain foods drinks and other related substances negatively affect the color of our teeth. Substances include soda pop, coffee, red wine, chocolate, some berries, nicotine and sugar. Antibiotics –at a certain stage, these can produce yellowish teeth. While maintaining proper oral hygiene throughout all life stages is a solid and necessary step, it may not be sufficient. Some people are content to accept the natural yellowing of teeth. Others are not. Some cases of yellowish teeth require medical replacements for better oral health; other instances see replacements for cosmetic reasons. Dental Implants – applied singly or part of a denture or bridge, implants permanently place porcelain or ceramic composite teeth in the mouth where once teeth resided. Whether we wish to accept our teeth as is or change them is a personal choice. Having yellow teeth may be socially detrimental. It may make us feel self-conscious. All our friends may bleach their teeth or purchase veneers. Yet, it is up to each of us to make the decision on whether cosmetic dental surgery is the solution.